Nick Kyrgios is good for the sport says one prominent women’s star. EUGENIE Bouchard and Nick Kyrgios were once rumoured to be a love match and it seems the Canadian star still has as soft spot for the enigmatic Australian. Kyrgios, exploded a racket and imploded in his fourth round 4-6 6-3 6-2 loss to Croatia's Borna Coric at the Miami Masters this week. He approached chair umpire Gianluca Moscarella to sarcastically congratulate the Italian's controlling of the match after receiving his point penalty, while down game point serving at 2-4 in the deciding set. Having already been warned for his behaviour, Kyrgios was left fuming. With the match all but lost, he shook left hands with the official at the ensuing changeover before he continued to berate him during the sit-down. 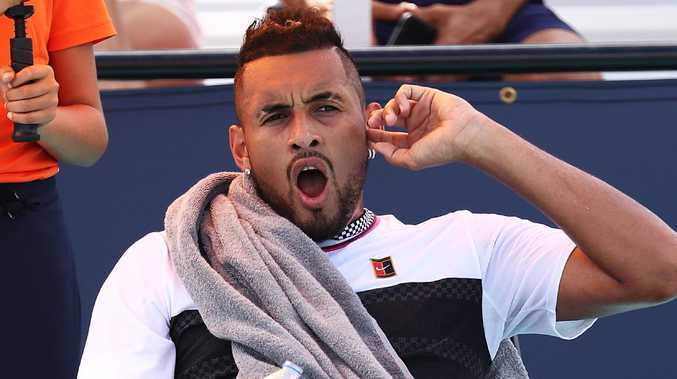 Kyrgios even went as far as putting his hand on the chair umpire's leg while he was talking to him and his display as usual attracted plenty of derision from tennis fans but Bouchard jumped to his defence. Eugenie Bouchard and Nick Kyrgios at the US Open. "How is he not good for the sport? He has ESPN talking about tennis." Bouchard posted on Instagram. The pair of course had played mixed doubles together in the past and at the time set tongues wagging with their cosy on-court relationship. And while Kyrgios may not have been everyone'c cup of tea this week with his antics an Australian legend, who also had a volatile relationship with chair umpires came to the Canberran's defence. Pat Cash, the 1987 Wimbledon champion suggested that Kyrgios should continue to be himself, while also leaping to his defence over using underarm serves against Serb Dusan Lajovic this week and moreover against Rafael Nadal in Acapulco, where the Australian won the title. 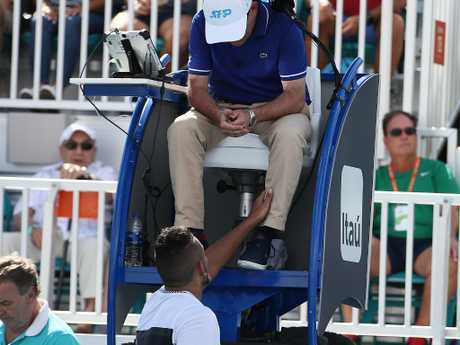 Nick Kyrgios puts his hand on umpire Gianluca Moscarella. Kyrgios was unrepentant after his match, taking aim at his courtside hecklers. "They paid money to see me play and they just screamed out ridiculous things, and I'm just not going to take it anymore," Kyrgios said. "I played for two hours and 20 minutes, and the guy yells at me: 'Play some tennis!' "I'm not going to take it, so I just said 'F you' to him. "Probably not needed but at that time I'd been competing and in the heat of the moment, and it's not what you want to hear."